Click Here for Admission Tickets! SHIFT is presenting cutting edge spiritual/energy healing and scientific technologies, authentic ancient health practices, and vendors offering you products, services, and education to realize your personal and family health and lifestyle dreams and visions. SHIFT New York is now combining forces with the new Institute for Spiritual Development in Oneonta. 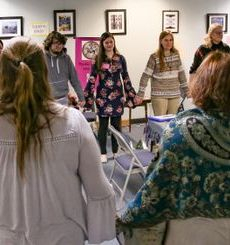 After 13 years of annual or semi-annual fairs, there will now be some smaller fairs, called "Spirit Fest," held at the ISD Lotus Center, and one BIG traditional SHIFT Holistic & Psychic Fair, held at the Quality Inn, in Oneonta. SHIFT New York and the Institute for Spiritual Development continue to address the major concerns of people today; finding alternative and complementary solutions to pain management, finding spiritual answers for life guidance questions; awakening one's own inner guidance system; finding new ways to alleviate stress and manifest the healthy, happy lifestyle for ourselves and our families that we desire. Admission Tickets are now available by clicking here. The April 27th, 28th Fair will feature private readings with 20 tried and true Psychic Readers, all with their own unique techniques for connecting to your spirit guides, and 10 or more highly trained powerful energy healers. There are many inspirational workshops to choose from this year that will spark up your life and help you to find your path. Our spring fair is being held at the Quality Inn, in Oneonta, NY. If you are interested in being a practitioner with ISD at the April 27th, 28th, 2019 SHIFT NY Holistic & Psychic Fair, for vendors, healers, psychic readers, henna tattoo artists, massage therapists, workshops, etc. Just click here for further information & to apply to participate. The fair's biggest draw is the FREE workshops, and for the April 27th, 28th fair, as in the past 14 years, we will have have over 20 qualified and respected instructors talking about intuition, Meditation, spiritual mediumship, self-healing techniques, and more! Click here to view the workshops. . . This fair promises to be chock-filled with insights, wisdom, and fun for the whole family. The SHIFT fair's proceeds will be donated to the mission of the Oneonta Chapter of the Institute for Spiritual Development. Come early, stay late! There is something for everyone of all ages. We'll see you at the fair!